Perfectly titled for a waterfall that makes noise of rock, called Irachal Parai (an adaptation of two Tamil words meant noise and rock) is one of natural paradise of Valparai, in Coimbatore District of Tamil Nadu. 7km from Valparai town, Irachal Parai Falls lies very close to the popular Balaji Temple in Valparai on the base of Akkamalai (Grass Hills). The water to the falls is originates from the springs in the Grass Hills (which is called the green carpet of Tamil Nadu) is source to perennial Nadumalai River, which flows through Valparai and also quench thirst the town people. 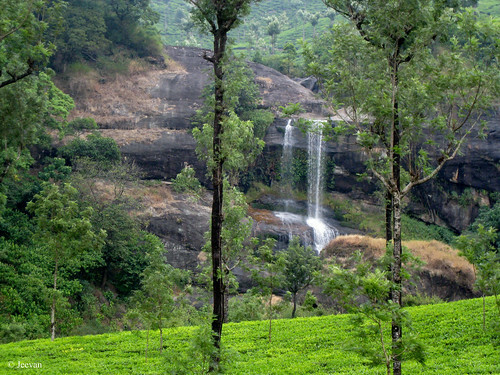 The waterfall lies inside the Pachamalai Tea Estate and on the edge of dense forest, is allowed to visit on the permission of the tea estate management. 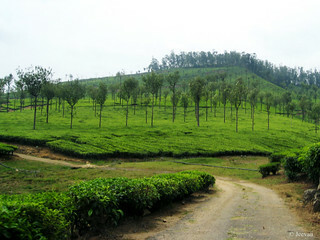 The estate’s tea factory is where one could get permission, which is also on the left-hand side of the road that leads to falls. Thanks to our relative who guided us there and also a resident of Valparai, had hesitated first in contacting the manager but glad he did it for us, if not we couldn’t have got a delightful opportunity getting our eyes treated in green and snow-white waterfall. Throughout the way was almost pretty shimmering in green and once crossed the check dam (that stores the water and sent it through the pipe for drinking purpose of town); the waterfall get into our sight amid lush green tea plantation and oak trees. The road was narrow and partially tarred, took us windingly to a newly constructed bridge across the creek where we stopped the car and enjoyed the sights of waterfall. The place was quite silent except for the noise of rock, even the quantity of water was less makes a nice fall. It is not advice to visit this place alone because of its frequent visit by wild animals from the nearby Shola forest. An old man we met there said, even a week early to our visit, a herd of elephant had broke down the estate’s bus shelter there. 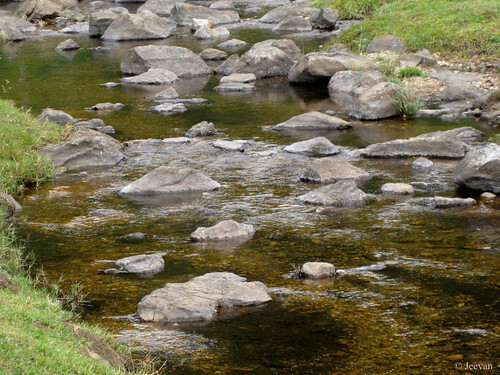 The climate was cool and water was pristine to make visible underwater creek, I enjoy the view from the bridge while others get down wetting their foot in cold creek. The most excited was our pet (Maya), who shows curious drinking water from creek. Generally, she holds affair for getting wet in water rather hate taking bath at home, was eager to enjoy in water but only we didn't allow her to do so. After sometime we find four boys come down the other side, showing their bare body was evident of their relish showered from fresh waterfalls. Maya drinking water in creek and mom holding her from getting into water; grandfather watching them from behind. It seems one really needs daring to take bath in this waterfall with sliding rocks around and during its full fledge its highly dangerous… this waterfall and river is prohibited from taking bath because of its drinking water purpose of the town. 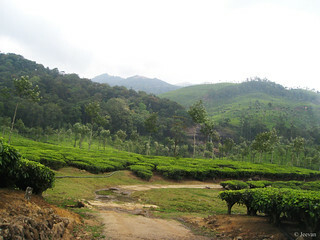 The water flow as stream here, make lovely pools near the check dam and mound of tea plantations around create scenic pictures. Down from the check-dam, the Karumalai Church got my attention. The pretty white church stands between tea plantations, on the hill other side wasn't clearly visible for photos and to get there we really need to make way through steps (will post few picture of the church later). I wake up to mom calling ‘maya maya’ in unusual hurry tone, from which I aware that our pet dog is creating some trouble outside and she also calling my brother to come out immediately. I only thought then that our pet might run out of the gate and some stray dogs chasing her or she may run chasing them, which is the situation many a time with her in case of unchained when outside the home. But things were different this time and she was running within our house compound walls chasing a cobra that came into ours. We have no idea where the cobra came from, but the garbage collectors were said to see the snake entering our house from the roadside. Encountering snakes aren’t new for us, as we have seen snakes in our early apartment area and the people resides here have also seen snakes many a time around. The open ground behind our house with number of trees and a broken workshop, could be nothing that a better hideout for snakes and only a 7 feet wall protects anything enter our compound. The heavy rain and wind lasted few days back, broke our water pipe from the over tank and only a day latter it was fixed by plumber, mom when to check if it was ok this morning, was followed by our pet who found the snake got chased. She was trying to bite the snake tail while pursing around, for which it protests by hissing and few strike attempts before tough climbing the wall and crawled though a Neem tree to a safe high. It was exciting and adventure for us this morning and the story still spreads from one another, Maya becomes heroin by her daring act against the snake. Lol! There’s another terrific story to share with u here, was as never like before, a lightening stroke very close to our house on Wednesday evening results in killing our LED TV. There was heavy thunderstorm in our area that evening, but a lightening came very first without warning had a loud blast and threaten to cease heart beats… which was the situation lasted for half an hour. Our pet also exposed to frustration for the loud cracks and it was like thousand fluorescent lamp blink at a time, and along with it the transformer also celebrated a pre-Diwali producing sparkles. We once again tuned to our free television set, provided by government, until the Led TV is back after its major transformation of motherboard. It was a situation similar to 2009, when our CRT TV shutdown, we went on watching programs on govt.’s free color television for a year before bought the LED… it was too exactly on the season of Navarathiri. Even we used set top box for cable television, the lightening took the life of our led TV and there were number of TV sets in our area lose to the lightening. We are always cautious and switch off television and unplug wires when there was thunderstorms, but it fall quite unexpectedly and it is our fault indeed. Not to forget, the cyclone Phailin is on its way ready to sweep the coastal Andhra Pradesh and Odisha in hours… let all hope and wishes there wasn’t much damage to our neighboring states. The cyclone is expected to be very strong storm, where experts guessing the wind could touch 240 km per hour when it landfall between Odisha and AP… the tides could rise up to 3.5 meters and rush 600 ms in land. We live in Smartphone era, but there was some period, peoples depend on phone were only on telephone booth and payphones fixed at some particular place or office or junction. For many people in India and abroad these payphones still helps at communication in absence of mobiles or emergency contact. Before telephones arrive at our homes, we used to visit the telephone booth or PCO (public call office) to make phone calls; and in my childhood days I have accompanied many a time my aunt to the red telephone booth or payphone in our area (Adyar) to make calls to her friends. I really enjoyed accompanying her not only because it was fun dropping the coin into the photo box and then dialing the rotary dial, she also get me chocolate or ice-cream while back home. There were also few shops in our area then had telephones, which they also make it as a public phone and collect money for talking. We were also asked to press a red button (an additional device attached to the phone to calculated our talk time) when beeps rise at the end of each minute of the call, like how we drop one rupee coin in the payphone boxes at the end of each minute to continue our talk. Those days, I guess, we can’t make STD (subscriber trunk dialing) calls or talk out of our city or town from the telephone booth or payphones but only visiting the specify shops that has STD or ISD facilities. Making an STD also means paying more money, so people don’t make much calls unless important and also put their calls short and sweet thinking of the high rate. These days we can’t find any of those pretty red telephone booths, but only the yellow payphones fix to the walls or poles in public places or in front of the shops and the minimum rate of call to make allover India is Rs.1 per minute. These payphones are provided by public telephone sector ‘BSNL’ and the amount received through these boxes are collected by neither shop owners nor BSNL employees, for which they are paid commission. 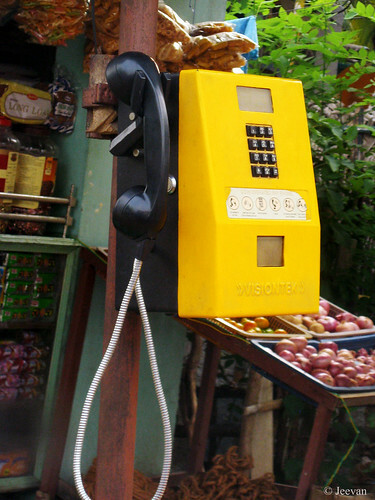 The picture above is a coin operated payphone… kept at a shop in a village called Kuppanur, on the foothills of Yercaud, Salem district of Tamil Nadu. The yellow phone was catching my attention for photo and it was the inspiration to write on phones here. for she embarrassed in red. who quench (love) thirst first. 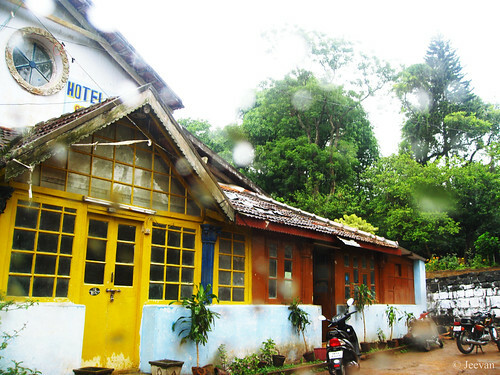 This is a hotel in Yercaud serves homemade Biriyanis… and while waiting outside, I find the colors painted on the hotel was very bright and catchy! It was slighting drizzling then, which are the drops on the image (as I shot it from inside the car) and the rain that last from previous night had added glorious to the green trees behind looks stunning. A newlywed couple, experience indifference in their marred life from the day one and both were only intend to agonize each other through silent acts of conflict. The flashback reveals their past, parting the film equally half with enough dose of love, comedy and tragedy making it a wholesome entertainment. After longtime, Nayantara had appeared in a Tamil film and along with Arya - both were seen paired in Boss En Bhaskaran - had ruled each other as Raja and Rani (King and Queen) on screen. Directed by debutant Atlee, had done a decent job by giving not much important to alcohol and such like comedy scenes had warm up with beer! The way he handled the post breakup scenes is appreciable, without much despair. Jai been Nayan’s love affair, doesn’t look fair but rather he appear like a younger brother to her. As a customer care employ, he makes fuss with Nayan and begs for releasing him from being irritated by multiple callers dialing his number - the people who receive customer care calls will enjoy the scene. The sweetest and cute part of the film for me personally was Nazriya Nazim’s role as Keerthana, makes cheery on the cake! She’s an example how sweet a girl could be… I like to add a line from Gautaman Bhaskaran of Hindustan Times, wrote: “the one person who caught my attention was Nazriya, who as an Arya’s lover, is absolutely gorgeous with a face that is so expressive that we do not need her to speak”. How true! Hehe… I have become a fan of her lately (check the lovely song of her on my sidebar from Tamil film Neram). Sathiyaraj as father of Nayantara was emotionally well done and called him as darling by her sounds different. 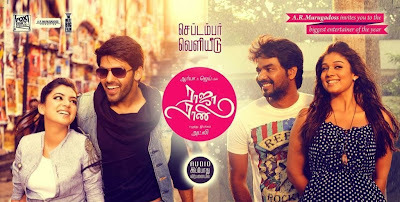 The music (by G.V Prakash) was wonderful overall and I esp. like the song Oday Oday, which is very peppy and stylish and the cinematography also involves creativity. Not to forget, Santhanam has been the minister of this kingdom of king and queen, but as a comedian he makes merely laugh for good rather constantly annoying. The indoor sequences look fair in soft light and the frames were all well composed in an artistic manner. Overall a decent modern family entertainment! As usual watched the film in the Drive-in Theater here and seldom was it crowded on Monday, we could find number of families with kids parked their seats in front of their cars. It was just like a proof how well the film had reached and received. Despite interruption of rain, everyone seems enjoyed the movie. 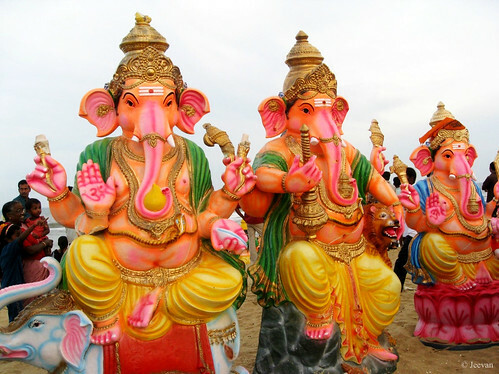 Every year following Ganesh Chathurthi, immersion of idols takes place at Chennai’s seashores on the first or second Sundays, that depend on the celebration of the festival. Here are photos shot at our nearest beach (Palavakkam) which is allotted for the idols kept around south Chennai to get immersed and on this day, the idols kept flowing into the beach front following number of processions. A Sunday back we tried to check the beach to see the immersion, but we couldn’t make it possible and the roads to the beach were blocked by row of vehicles standing for a km. 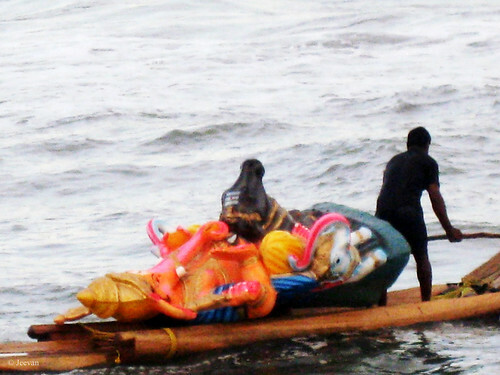 The picture above and below are few years old, showing the idols kept on the beach before cranes uplift them into the sea and a fishermen taking an idol in the catamaran to immerse into the sea. 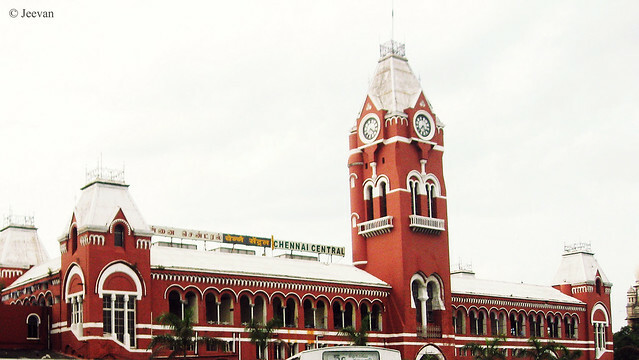 Being a Chennaitie, my first tourist destination outside Chennai is perhaps Mahabs. 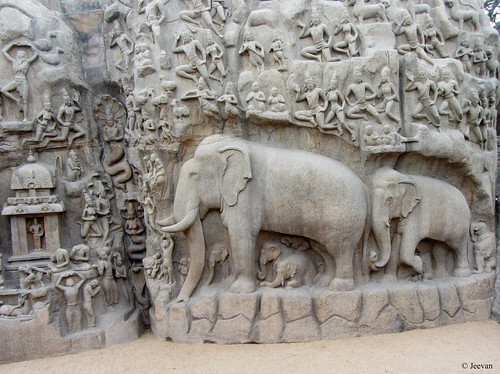 But Mamallapuram being my ancestor’s town I could not consider it as a tourist destination first and I have been there countless time and many a visit to the town has sighted in any of the sculpture site. My most favorite place then at Mamallapuram was Venna Tharatna Kal (butter ball) and we frequent there esp. to have fun sliding on the rock slopes. 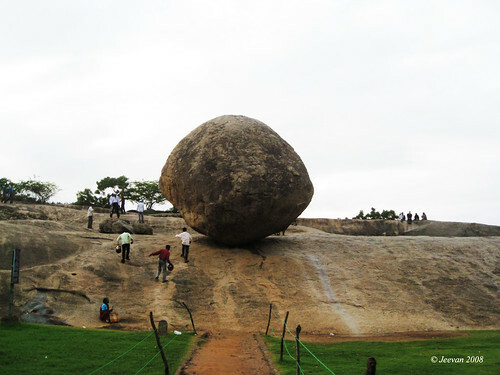 Krishna’s Butter Ball is a natural wonder, where a large rock boulder balance on the sliding rock surface is believed as a stone found on Krishna’s plate. The Pallava kings had tried to pull down the huge boulder with the help of their elephant force (thinking anytime the rock could roll down) but failed in their attempt. The lush green lawn in front of this rock (once an open ground for cattle to rest) take one for pleasant calm and as a group to sit and chit chat. I have been strolled behind the rock slopes and crossing the gaps between rocks and there was a well with green water, which was called Sita Kinaru (well) because it is believed that Sita bathed in that well. I have no pictures on them, but I still hold memories on those sight and there was also a path lead to our relative’s house then. I hope everything were blocked and fenced by ASI, doing wonderful job in protecting the sculptors and rocks. 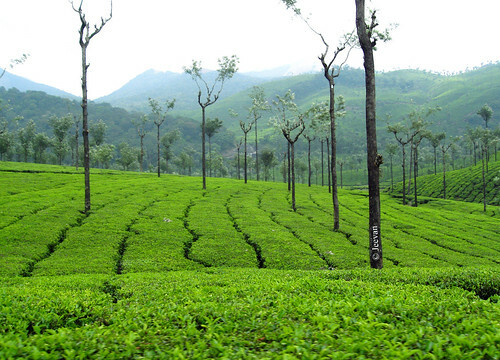 We never thought then these places will take such pleasant enhancement and flourish in green. Another place I liked and which is close to butter ball was Arjunan Penance. It is a giant bas-relief filled with marvelous carvings of various human forms and animals; the most fascinating part overall for me personally then were the Elephants. The sculptor of elephant couple and cute calves carved on the bottom of the bas-relief could be a favorite sight for any child and the pit reveal the bottom part was something dragged me then to look what is inside. Another pretty scene next to this site was a sculptor of monkey looking lice on another. 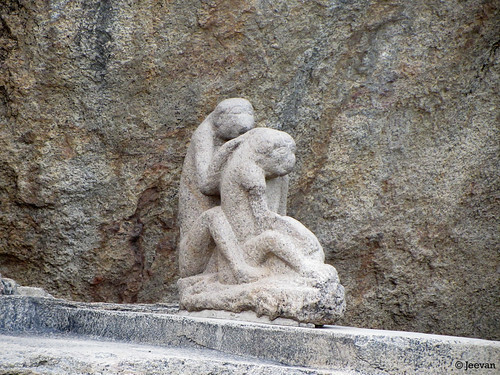 As kids (me and my bro) we used to go and stand behind the sculptor and pose like looking lice on the monkey sculpture. Beneath the monkeys, there’s a small slide to play and a rock carved steps to climb on, but I don't like it much as the natural sliding near the butter ball. The slide was partially hid now after the earth rose because of the lawn making. Just thought to write something for the World Tourism Day today and here’s a brief account on my first tourist destination out of Chennai. as a stranger into our home. 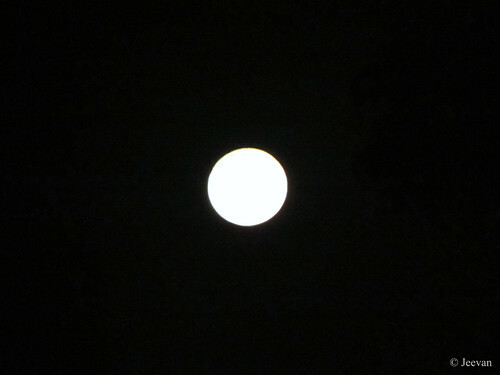 to rejoin its journey by wind. 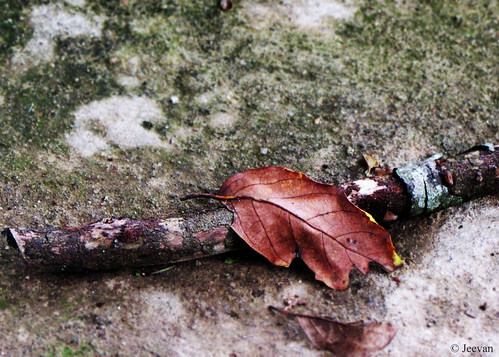 The picture above was captured by me on a dry leaf, but slightly under wet condition. The poem is related to home experience. 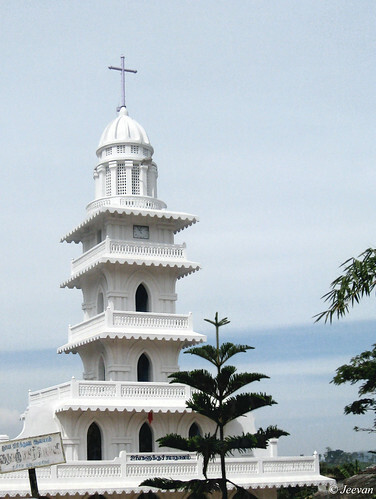 The first time when I landed on Valparai (near Coimbatore) was a day prior to Christmas and the CSI Church in the heart of the town, was illuminated in colorful bulbs and decorated Christmas trees. We just passed the church in thought to return next day, since the sight catch-up with the festival mood and the shops were all doing bright business, selling stars and decorative item hanging around, the main road stretched in festival spirit. 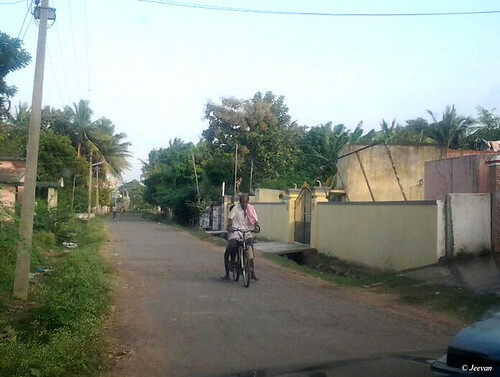 We stayed at a house adjoined to our relative’s there, supported to take us to the church and shopping but we couldn't makeup next day as we returned to the town too late at night after visiting a faraway place into Kerala. We could have made a visit other day, but we lost somewhere our interest due to visiting other places or various attractions. 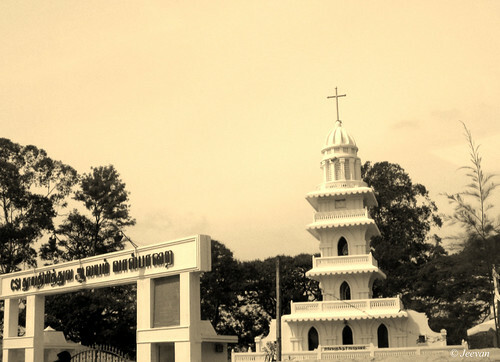 The photos here are captured during my second visit to Valparai and we haven’t visited the church this time as well. 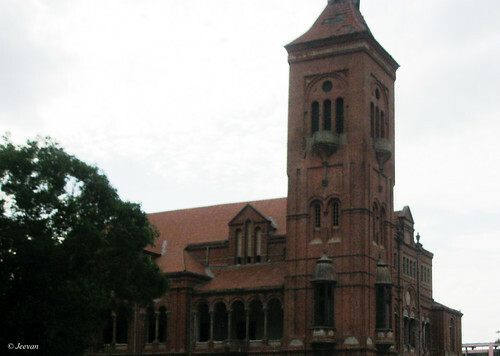 But I was glad to capture some glimpse of this pretty white church constructed in shape of pyramid and three storeys with balconies and a clock on the top floor. 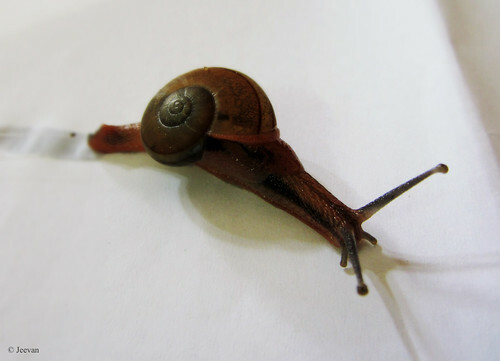 The snail entered our house as an uninvited guest, without resisting I leaned a white sheet (with the help of dad) transferred her from the floor to my table to conduct photoshoot. I shot her from different angle and without hesitation or go hiding inside the shell; she copes well with the photo shoot, giving various poses exposing her glitter and glam even in low light. I don't want to trouble her much, so finished shooting as soon possible and left outside to crawl back to her home. 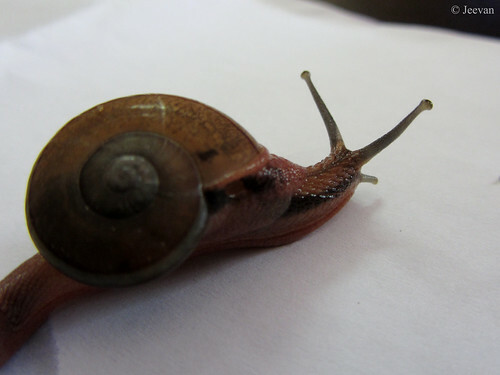 She wore a shell, designed spiral and color similar to her pinkish showy skin and black stripes on each side. 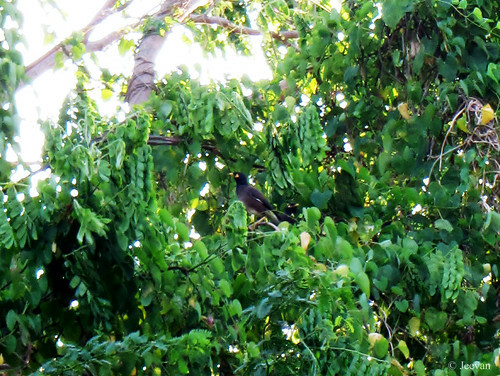 I know that I already miss badly the birds and green canopy that gave me great company and joy in my previous residence by shifted home, but I was glad even I can’t keep watching the birds, they cherish the green space spread over the neighborhood. 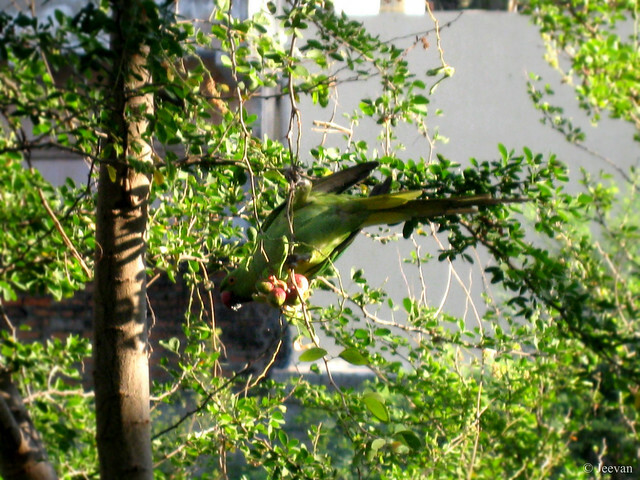 Not only birds, but snakes and few reptile species and mongoose were resident of this wild vegetation that has Gulmohar, Peepal tree, Albizia saman and Camachile (which often sighted with parrots perching) to name among the number of unknown shrubs and bushes. I was shocked to know from my parents who visited our old apartment flat today, that the entire green space of our next compound where destroyed to ground level prior to building constructs. The picture shot during one foggy morning of winter, overlooking our car parking partially taking shelter by trees and bushes. 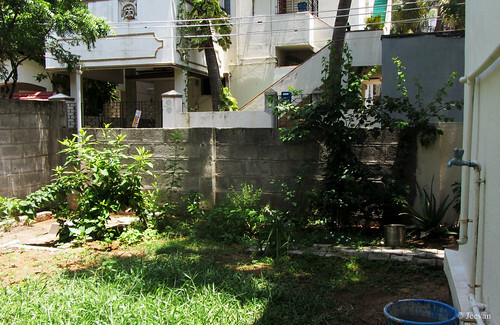 From the time we shifted to that apartment 7 year’s back, leaving our native home in Adyar, the plot next to ours was vacant to be only occupied by wild vegetation and few flowering trees. The plot seemed to be under lawsuit, left untouched by the owners and even it went through a partial cleanup of green during our time of resident, it took a new leash of life from the debris. I used to tell to my mom that if they happen to construct the site we should look house somewhere else, because, only the environment outside the house made me sustain over there. It’s a treat to visual and hearing everyday expose to birds and their sweet twitters, kept me inspiring throughout the years. I couldn’t digest it now hearing from mom that everything was uprooted and down to ground level in couple of days. My inspiration for bird watching was brought up from there, and I have seen all kind of birds in common there rather some regular visitors like Kingfisher, yellow billed babbler, mynahs and long time resident Asian Koels! To say in few words it’s a small bird paradise comprising birds of immigrant! Post monsoons, we get to see many water birds like Pond Herons, Little egrets, Cormorants and Water Hens visiting the plot which would look like a pond with 2-3ft in water. 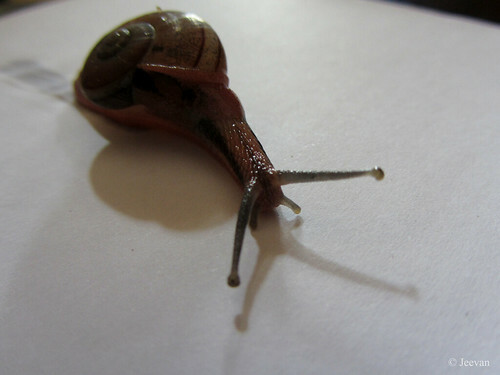 Two days of constant rain is enough to stimulate the sleeping frogs to raise alarms and snails begin crossing our parking a lot. 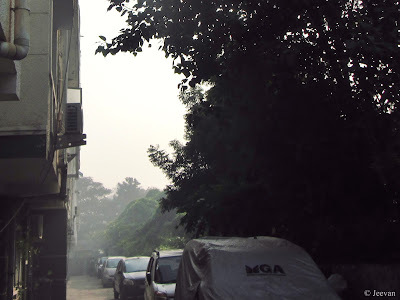 The vegetation and trees had been a sunshade for our apartment, as all cars are parked beside the compound wall it provides a canopy from sunlight and heat. At the end of summer, the Gulmohar (right in front of our doorstep) would whoop red flames adding glory to shimmering green shrubs and in rain adorn by sticking dewdrops on fern tips. The Peepal tree on its part, cheered, when I feel downfall by clapping with its palm like leaves to the wind motion and rolling on ground as dry leaves making crunchy noise as music. Apart being a dump yard in case absence of garbage collector, the open plot is a hideout for snakes and its archenemy mongooses, who make noise occasional like clashing with snakes? I feel at least good, that the cleanup does not take place when we staying there and for me to see my favorite green space deriving empty. I at least hope the birds that make their way home there nestle somewhere safely. 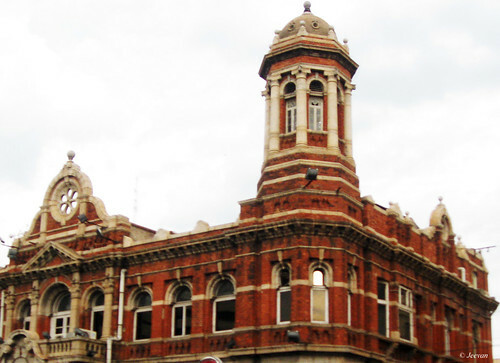 But I wonder and worry what would have happened to the snakes and mongooses that have least way of escaping, since all sides are enclosed by compound walls adjoining buildings. I was feeling somehow down for disown the green space by shifting house, but hope to develop my own green space around the new home… the cleanup has come up with least uplift in my feeling that I no more miss them, but lost entirely to its own destruction in name of development. a colorful photograph of rainbow. 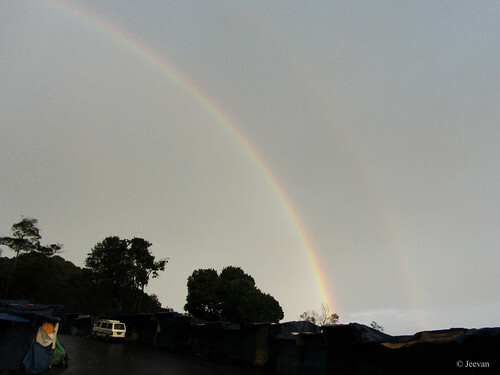 Above is a photo I shot at Kodaikanal while come back from Poombarai… I witnessed more than couple of rainbows within less than 10km radius. Here is a rainbow captured near Pillar Rocks and never like before, the place was so empty with all shops shut, we stopped the car in the middle of the road and shot this marvelous rainbow which I ever seen such colorful and long visible curve. If you look careful, there’s a trace of another rainbow above the present one. You all know that The Thanjavur Big Temple, also called as Brihadeeswarar Temple is a part of UNESCO World Heritage Site and an architecture pinnacle of Cholas, built thousand years ago by RajaRaja Cholan (in 1010). 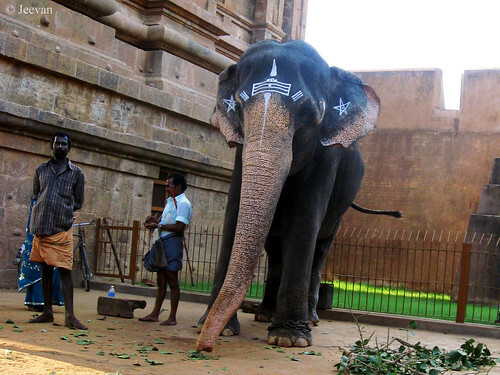 Vellaiyammal was a 63 year old elephant donated to Thanjavur Mariamman Koil Temple by veteran actor Shivaji Ganesan when she was a year old, shifted to Big Temple in later days. 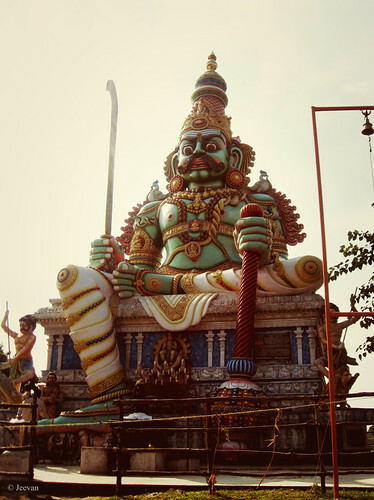 I visited the Big Temple during its millennium year of built and find the Vellaiyammal blessing the devotees and tourist entering the temple, by standing between the first and second gopuram (tower). The elephant seemed very kind being, moving side-by-side constantly, wore a neatly drawn bar on its forehead and stars on each ear. I stood there sometime watching its activity and captured few shots (flash off) before moving inside the temple without a mind to move on. During my childhood I fear a lot for elephants and every time a mahout drives elephant across our street I would go and stand on our balcony to watch it safely. 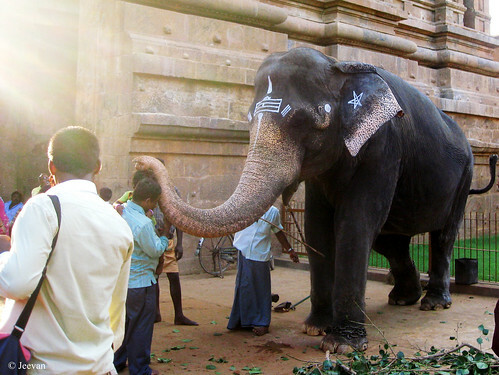 Before the ban imposed on elephants being used for begging on streets in our state, we could see temple elephants drove by mahouts on streets to make their own collection out of elephant’s free time. Every time I hear a bell sound, I would rush out to look for elephant and so was my affection toward them even I still bear little fear for them, I love the pachyderm sincerely. Vellaiyammal was suffered from knee pain for the last seven years, due to old age, made her unable to lie or sleep properly. The elephant had been on stand for last few years, slept only by slanting on the wall and was often fell ill to get treated by doctors, breathed her last after fell down at the early hours of morning today. Hearing this I couldn't avoid recollecting the moment stood in front of her and watching the majestic beauty, inviting us into the Big Temple. 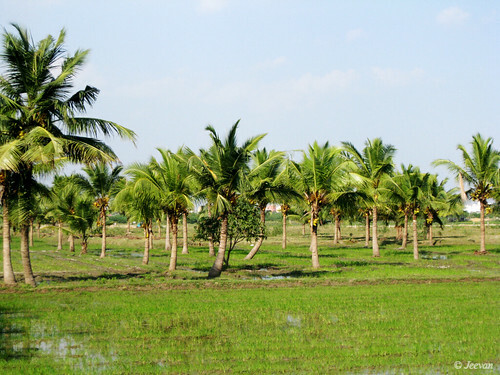 Chennai has become a cool paradise over the last few days of constant rain, due to low pressure in Bay of Bengal. It was quite pleasing these days and was inspiring a lot, despite feeling lazy to do something in sleepiest mood which remind me my school days, where I used to feel sluggish during the early hours of morning at any rainy day. And once the fans are switched on, I used to feel like sleeping infinitely at the desk. After long time I feeling the coldness of rain, perhaps due to sand and soil environment surrounded this house unlike our early apartment which has cement floors around that keeps away the wetness and cold. Here I could experience rain on all sides of the house rather only the southern side get wet in our early house in apartment, so it won't be cooler whether it rains or winter dews. My grandmother used to say it’s very cool at their house, but coming to our house they would experience warm in winter. Because of the position of the house, the sunlight used to fall on the walls of our house throughout the day keeps it warmth the whole night. It was an awesome benefit we lose utmost by shifting our house; the summers were never like that before, which I used to say to my cousin that how much, you pay, you could not buy this caressing wind. 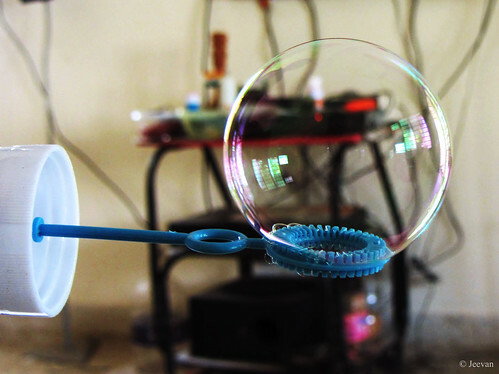 We gain and lose certain aspects that used to be our favor, but doesn’t life based on balance? We experience pleasure in rain, as well it become pressure in case crosses the limit. Coming to Chennai, showering is very special as we left with brief season of monsoon and many a time rain becomes a mirage, showing its grey face but fail showering grace. At same time, moderate showering could leave the city congested with lack of proper drainage facilities and uncontrolled vehicle population always make rain fall prey down. With no space for water to drain, no use blaming the rain! 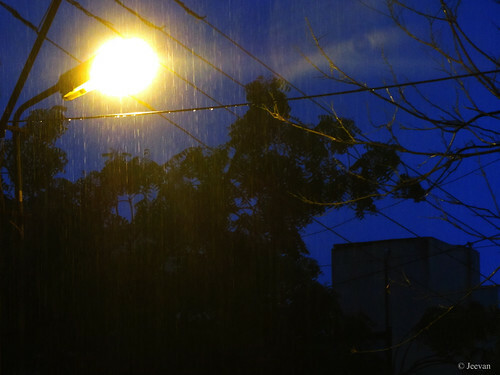 Photo shot at our street light while it rains one evening. Ashok has nominated me to participate in a Travel Photography contest by Rhino Car Hire… The theme is to depict modes of travel captured during ours… so here are my pictures based on travel from my random trips. This picture was shot at Pulicat Lake, also called as Pazaverkadu - the second largest salt backwater lake come lagoon in India. Before a bridge was constructed in year 2009 across the lake to connect the island village near the estuary (where lake meet with Bay of Bengal), Boats were the only sources of transport alternate to buffalo carts that wade thought water during low tides. 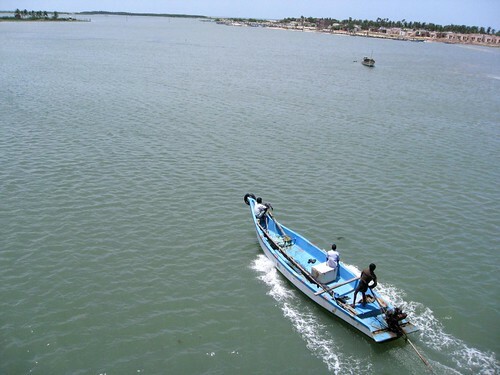 Fishing is the livelihood of Pulicat, where they fish both on lake and sea. 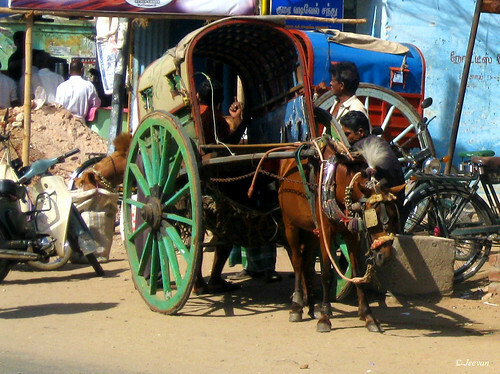 Captured in Periyakulam, Theni district of Tamil Nadu, the Horse Carts are still used as transportation there apart few other towns. The horse cart, also called as Tangas in India and its neighboring countries and it is a popular mode of transportation because they are fun to ride in, and are usually cheaper to hire than a taxi or rickshaw. 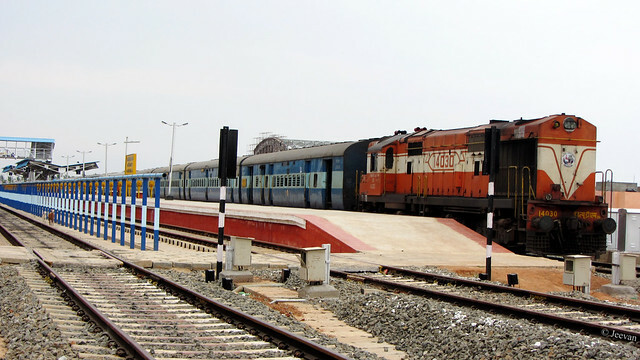 While driving to Karaikal Beach, we cross the Karaikal railway station which looked deserted and a Train was stationed stretching up to the ramp of platform. We slowdown the car across the track after passing the gate; I took this shot without hurry knowing hopefully no train arrives. 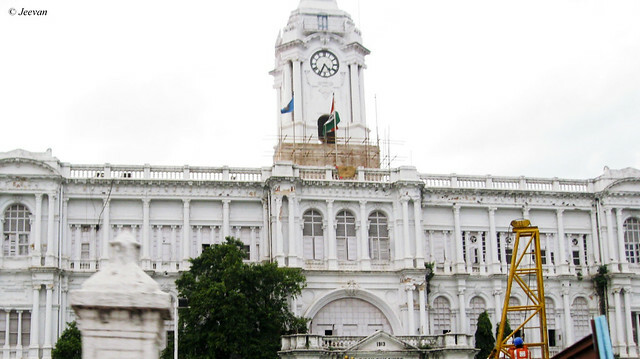 Karaikal is a part of Union territory of India coming under the Pondicherry administration. 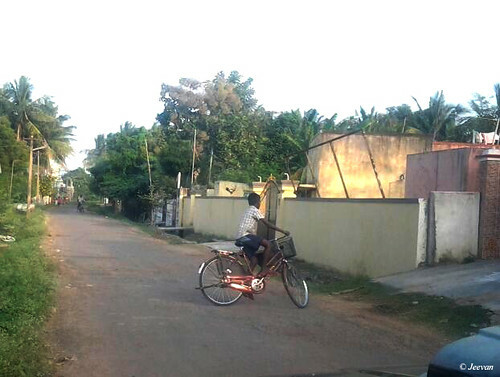 Shot this picture (using mobile) at the outskirt of Chennai, where a boy riding his Cycle on the village streets… following one is from the same road, where an old man pedaling cycle, perhaps make sitting his grandson at rear carrier. 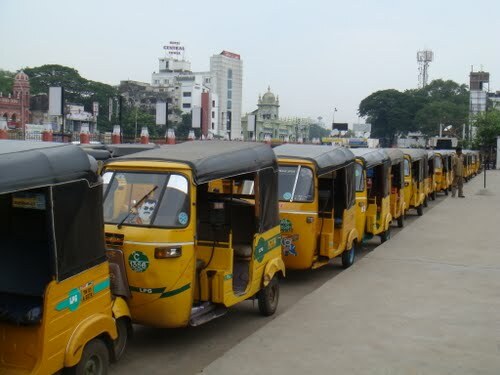 Cycles are a common and basic transportation mode which has health benefits as well as eco-friendly vehicles. For kids, riding bicycles are much favorite and no one could have escaped from having fun with cycle during their childhood days and getting warrior scars. I have never fly across the sky in a flight and I have no pictures on airways… so here is a Flight model I shot at HAL museum in Bangalore. 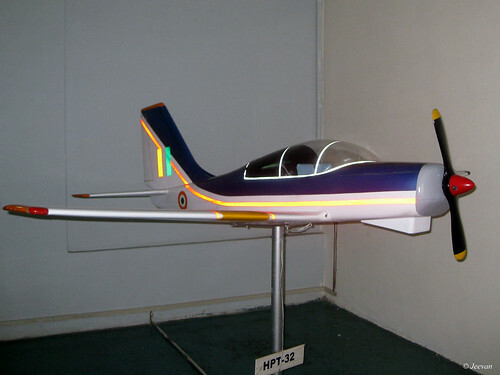 The HAL HPT-32 Deepak ("lamp" in Sanskrit) is an Indian prop-driven primary trainer manufactured by Hindustan Aeronautics Limited. The aircraft can accommodate one passenger and the student and the instructor can sit side-by-side. 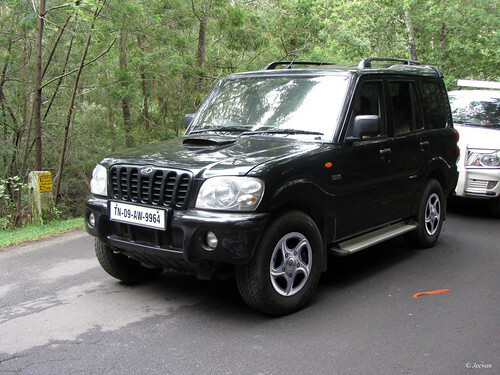 At last here is my travel mode Mahindra Scorpio. We bought this car in 2011 and even before it we had a similar one, only because for my comfort we continue to choose this model. For me it’s an Indian Hummer… because it took me almost everywhere I love to travel. My cousin shot this while caught in a traffic jam at Kodaikanal. There was a mixed feeling being shifted to this house more than four months back. There were many ups and downs related to family and home environment, but the part of my life travels on similar path, more or less, nothing bothered me much and I don’t feel much change in my life, apart some mishap with father (who’s just back to normal after his bike fall) which led our life thought physically trouble and emotional stress. For nearly two months, mom had been the only caretaker of mine to take care of my needs indeed without the support of dad, which was the troublesome phase ever in my life. Today everything seem to be nothing and the difficult times are no more, because, they are almost become a part of my practical life. Leaving those behind, life has been wonderful with pros and cons and the weather on other hand had been very pleasant these days unlike extremely hot when we shifted home back in April and followed by sultry May. The rain that make way through last two months had sent wakeup calls to mosquitoes (even though they aren’t new for us and they are almost everywhere around Chennai) we are forced to close all the windows and door before 6 pm to prevent them enough. Even we can’t sleep without fans on; glad we have an inverter to keep us asleep when the power goes off often when it rains. The house is well lit throughout the day without a need for lights (each room has two wide windows) only the wind couldn’t enter much unless there’s heavy blow outside. We aren’t daring to keep all windows open to make free entry for mosquitoes since we haven’t put nets for windows like how we done at our early house. Though it isn’t a matter anyway, but maintaining the house to keep clean wasn’t easy enough which was double the size of our early one and with trees around we can’t stop leaves thrown down. But what I liked more was the small garden space of the backyard, which is enough to say than nothing, and who won’t dream of a house with garden space. I liked it much and want to see it bloom with flowers and grasses. Before we come to this home, my bro wanted to make lawns with the open spaces around but once rain stared to pour the grasses began to grow on its own on the open space. I know they aren't the grasses use for lawns, but a kind of wild weeds growing fast to a foot now and looking for a cleanup. 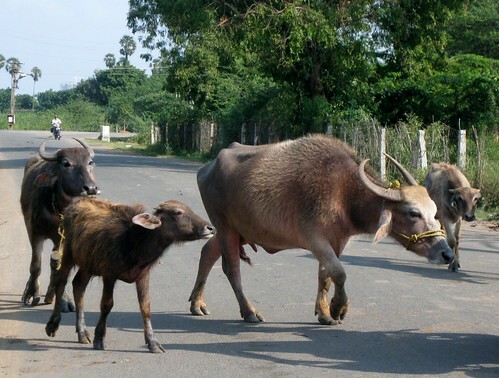 I suggest mom to direct a cow (those pass our house everyday and some time lie close to our compound for the shadow of the tree) to have the grasses as its breakfast, but she don’t like my idea saying that it will also eat our others plants. 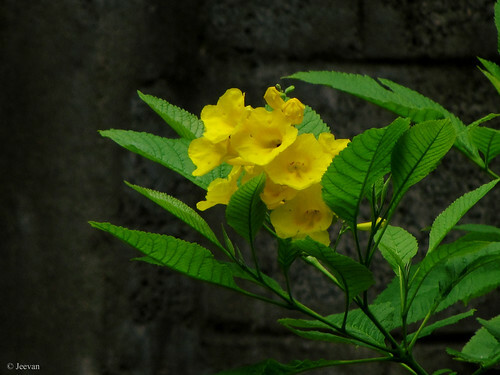 We had re-planted some of our pot plants there and there’s already a yellow flowering shrub and bougainvillea that need to grow enough to see blossom. 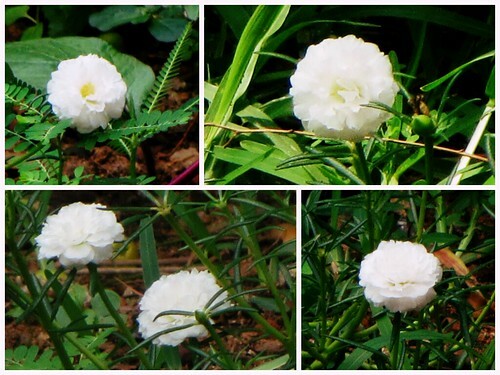 There are jasmines, hibiscuses, anthimanthaarai (4 O'clocks flower) and button roses (check the collage above) growing close to ground. 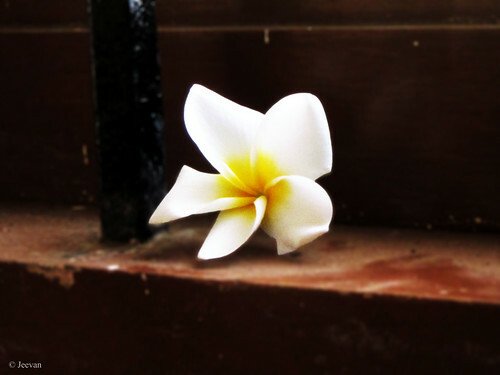 It’s so good to see them blooming like white bulbs every morning and 4 O'clock flowers in cheerful yellow, there’s also a white frangipani tree at our parking dropping fabulous flowers. Just four months old, the neighbors were still strange enough except for this only family that made touch with us, since facing our side front it was easy making friendship with them. 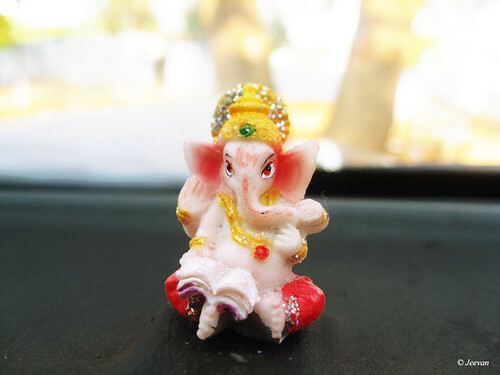 Dashboard Ganesh is the name I given to this pretty little idol that embellished our car dashboard before it broke away a year ago. The idol was made of marble and about 2 inches in size! using its thin layer of film. 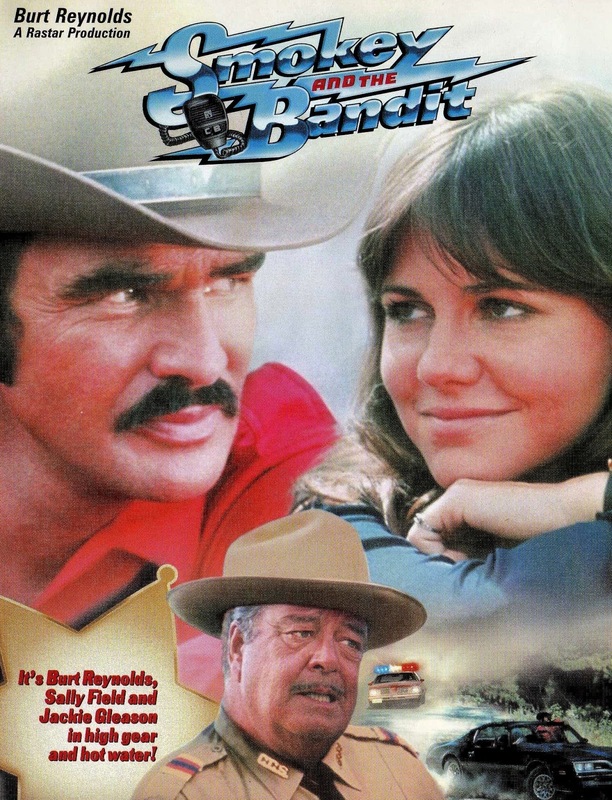 I had fun on Sunday watching the film Smokey and the Bandit, a comedy action entertainment featuring Burt Reynolds, Sally Field and Jackie Gleason. The 1977 film, based on a series of high-speed pursuit has commendable comedy scenes comprising action and hilarious lines, settles on a simple track of transporting a truckload of beer across state lines of US. Two truck-divers (Bandit and Snowman) accepts the challenge of picking up a truckload of beer from Texas to southern Georgia, which is illegal at that time to transport specific kind of beer across state lines, for the refreshment of two big-shots. Soon enough both were at the highways; Bandit on his black Pontiac Trans Am (a speedy car) kept roping the police towards him (as a decoy) to keep away their attention from the illegal truckload driving by Snowman. Meanwhile Bandit picks up a runaway bride ‘Carrie’ on his car where he becomes the target of Texas Sheriff ‘Justice’, a senior law officer whose younger son was yet to be Carrie’s groom. With specific time and distance in miles, the film runs at high speed chasing, skating, jumping and floating of cars was highly influenced by CB radios, through which they seek acquaintance from fellow truckers that help them to escape from police pursuits. The most interesting part of the film was music, which captivate the mood exactly while on pursuit and increases the speed thrill. The best of all was legendary Jackie Gleason’s character as law officer targeting the Bandit, whose serious intentions all make laugh as it become funny. Apart Burt Reynolds and Sally Field - as lead make charm and become sweet companion on the pursuit - the ‘Pontiac Trans Am’ has been hero wades through different terrains. The film seems to be inspiration for many films unrolled on the series of pursuit and I could relate many Indian movies with similar stunt sequences which perhaps could be a replica of Smokey and the Bandit. The film director (Hal Needham) himself been a stuntman has left impression. It is the only movie I have experienced with constant chasing entertainment… may be there could be some need to check.